Public value creation – a new management approach? Efficiency cannot be an end in itself, but it can be a means to an end. And the goal must be rooted in how organisations create value in society, says CBS Professor Anne Reff Pedersen, director of the Master of Public Governance (MPG) programme. The topic of this year's MPG conference on Tuesday 25 September at the Danish National Museum is public value creation and the opportunities that lie in the concept of public value as a new management approach. - Management-wise the public sector is in a period of stagnation. This year the Leadership Commission set up by the government to support better management in the public sector has generated a debate about public leadership practice, while new public management as a management approach drew heavy criticism last year. The statement comes from Anne Reff Pedersen, professor with special responsibilities at the Department of Organisation at CBS and Programme Director of Master of Public Governance. She points out that public value creation could open the door to a new form of management, which could be instrumental in creating value for society. - Often, we discuss the public sector's core function from a user perspective. Public value creation is a broad concept that looks at how the sector can create value for users, employees and society alike. - This means that as a leader you need to think strategically. What type of value is it that you are seeking to create? The starting point for your leadership should not simply be your own organisation, but where your organisation is positioned in society, says Pedersen. Professor Mark H. Moore from Harvard University is the man who coined the term public value. He will be coming to Denmark to be main speaker at MPG’s annual conference and join in the discussion on how the concept can be used in a management context and as a new management approach – also in a Nordic context. Moore points out how organisations, when looking to create value, need to secure legitimacy both within the organisation and in society. Read more on the subject in his latest book, Recognizing Public Value. - As a manager, you typically think along the lines of how to optimise and create efficiency at the hospital where you are employed. However, for patients, the level of efficiency at Herlev Gentofte Hospital is not the only important factor, as patient care involve a number of different stakeholders. With the term public value we think in terms of interconnectedness or in terms of a network where each individual entity contributes to something bigger, explains Anne Reff Pedersen. Come to MPG's annual conference on Tuesday 25 September and find out how we can create greater and better public value and enjoy the opportunity to spar, network and be challenged by peers. 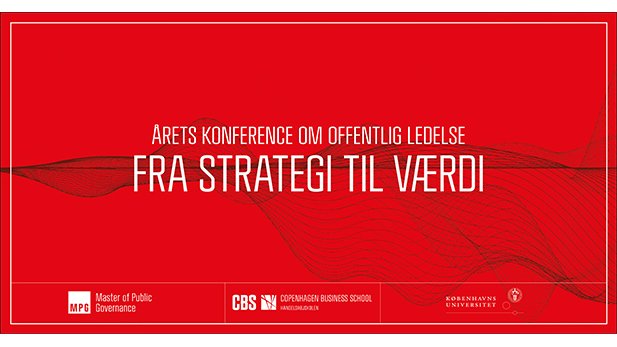 During the conference the topic of Public Value Creation will be approached from different angles. Jacob Rosenkrands, presenter of Danish Broadcasting Corporation's TV programme Deadline, will host the conference, and the event will kick off with an interview with Danish National Museum's relatively recently appointed director, Rane Willerslev. Mark H. Moore's concept of public value will be presented, after which the programme will be dedicated to a debate on how the concept could be applied in a management context, starting with discussions in more intimate master classes led by committed teachers and researchers from the MPG programme and then subsequently in a panel discussion. The panel consists of relevant and competent high-profile figures from both the private and public sectors, who will launch the debate by each explaining how they work with public value creation and proposing how they and the conference participants could help to highlight the issue of how to create greater and better public value. Director-General of the Danish Broadcasting Corporation DR, Maria Rørbye Rønn, who can provide insight into and different angles on managing an organisation that has multiple management approaches and interested parties. Executive Director of City of Copenhagen's financial administration, Peter Stensgaard Mørch, who can explain how, as a manager, he balances financial efficiency and quality and also manages the financial aspects of creating value for the city's residents and employees. Former director of the Agency for Digitisation and current Head of Digitalisation at the Confederation of Danish Industry, Lars Frelle-Petersen, who with entering the private labour market after many years' experience in senior posts in a number of ministries and departments can offer his observations about how management and value creation are handled in both sectors.